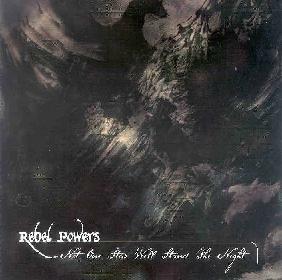 Rebel Powers - "Not One Star Will Stand The Night"
The title of the first of two lengthy tracks on this album sums up the mood of the entire recording: We Are of the Dark. Yet another side project from Acid Mothers Temple main man Kawabata Makoto, this time joined by fellow AMT disciples Cotton Casino, Koizume Hajime, as well as David Keenan, guitarist from Scottish psychedelic band Telstar Ponies, Not One Star Will Stand the Night is truly primal in its darkness. Makoto and Keenan play low, gently fuzzy, droning guitars that march to Hajime’s jangling, tinkling percussion whilst Casino’s high-pitched, ethereal voice drifts in and out. The music is stark and minimalist, completely improvised, from its slower more meditative passages to surges of feedback that reach intense highs. Makoto also plays sarangi, an Indian bowed instrument, bringing touches of exotic flavour to the sound. We Are of the Dark and the second piece on the album, Our God is a Mighty Fortress, are very similar sounding, dark companions to each other, or perhaps two movements of one lengthy piece. This is like the soundtrack to some distant, never remembered time before man or beast walked the earth, when ancient gods slept beneath the stars, waiting to be born. Not One Star Will Stand the Night is chill out music, for sure, but it’s never boring. It’s the kind of music that draws you into it for its entire 49 minutes. During that time, the world around you will cease to exist, and you will forget everything else. You will be "of the dark" too.